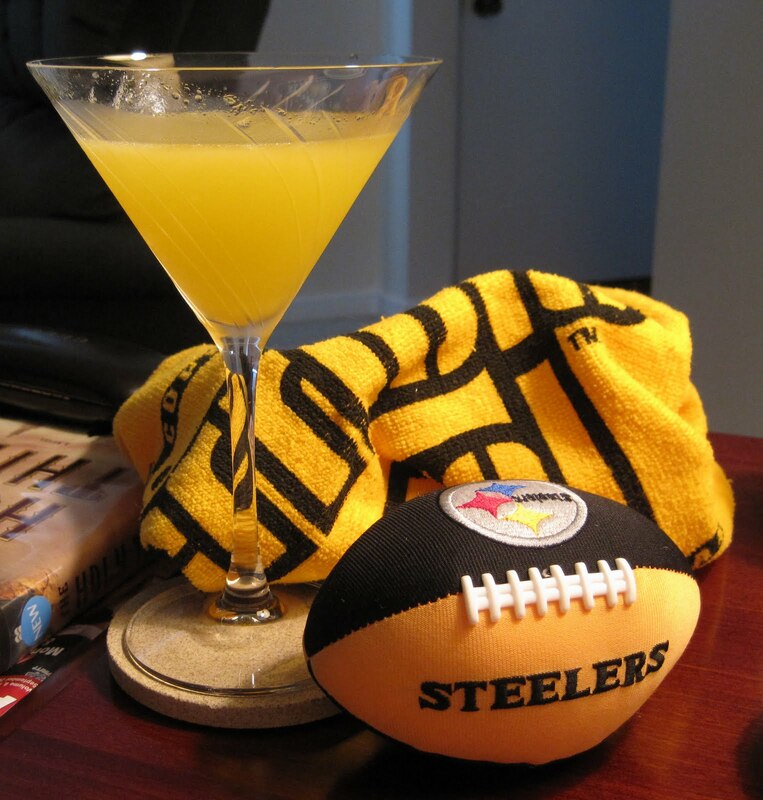 Today is my mom's birthday and opening day for the Steelers - yay! Being born and raised in Pittsburgh by a football loving family means I, too, love football, specifically the Pittsburgh Steelers. Unfortunately for my mom, who lives in Las Vegas, she was not able to celebrate her birthday while enjoying the Steelers victory. She had to watch the sports ticker, hope for game break high-lights (Cincinnati-New England was televised in their area), and wait for my phone calls: "MY MAN DID IT POO INTERCEPTED!!!!!" (Side note: that's what we call my favorite player, #43, Polamalu; someone in my family couldn't say his name so we shortened it to 'Poo') and then the "DID YOU SEE IT YET MENDENHALL SCORED IN OT" phone call. Yes, we're a little crazy during games and frequently call each other to 'gloat' when 'our players' do something fantastic (you should have heard the gloating from Vegas when Holmes made that Super Bowl winning catch). But I digress. Almost as important as the game is the food! Usually we don't do anything special for the games, but since it was opening day, we decided to have game snacks for lunch. 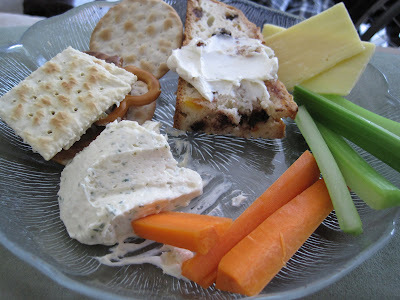 Here's the living room table: And here's my first plate of snacks/lunch: Saltines, Carrs cracked pepper crackers, unsalted pretzels, sourdough pretzels, soda bread with chocolate & candied orange peel, Kerrygold cheddar cheese, celery, carrots, and cheddar ale spread. Mmmmm. I ate my way through the first half of the game. After the game, I had a celebratory orange martini while we watched some more football and then finally around 6 pm we managed to move our snack-filled bodies to the kitchen for dinner, which was very simple: grilled veggies, grilled sausage, and tomato-cucumber salad. I made the cucumber-tomato salad in the morning. My grandma made this a lot: at Easter for with ham sandwiches, at summer picnics, my dad loves it with meatloaf. 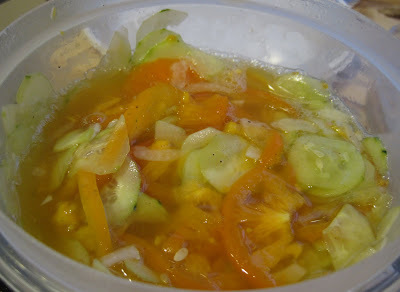 I sliced 2 cucumbers from the farmers market, 3 orange heirloom tomatoes from the farmers market, a bit of CSA onion, and then poured in a mixture of 1/4 cup apple cider vinegar, 1/2 cup water, salt, pepper, and 4-5 tsp sugar. It's important to let this marinate for a few hours before enjoying. This is a rough estimate; you can use more/less of each ingredient to suit your personal taste and SP says his family used to use Sweet'N Low instead of sugar. 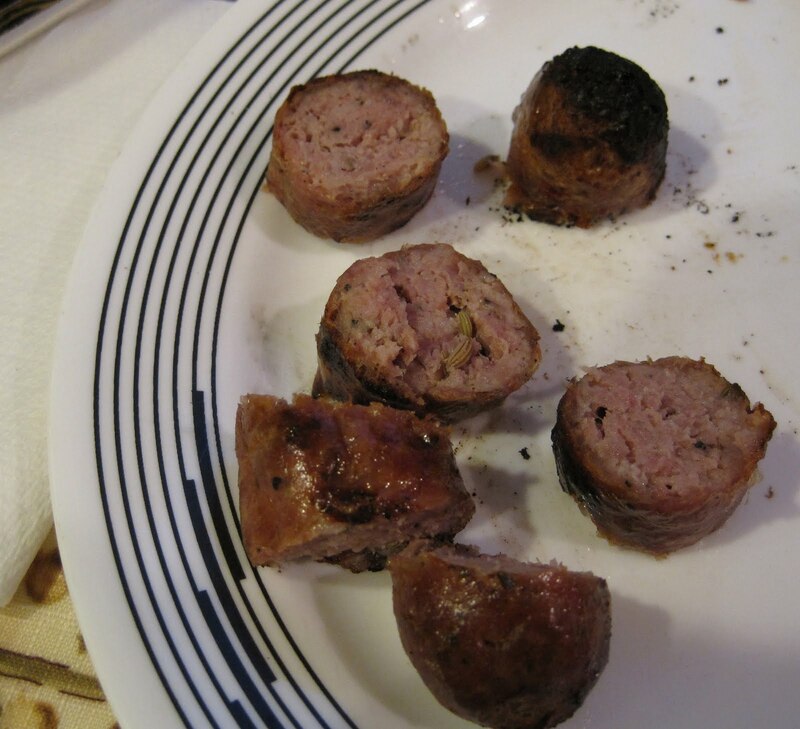 SP grilled some red peppers and onions to eat with the grilled Italian sausage: These were pretty tasty. Not spicy. 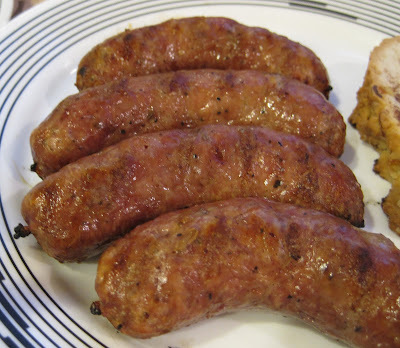 When I cut into mine, I could see fennel: We didn't buy buns for sausage sandwiches because we figured we'd be full from snacking and a bun would be too much food! 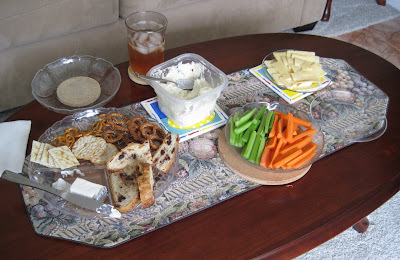 Tasty snacks and dinner plus a Steelers victory - and yes, a NY Giants victory, too, for SP (yes, he's a Giants fan). A great Sunday!